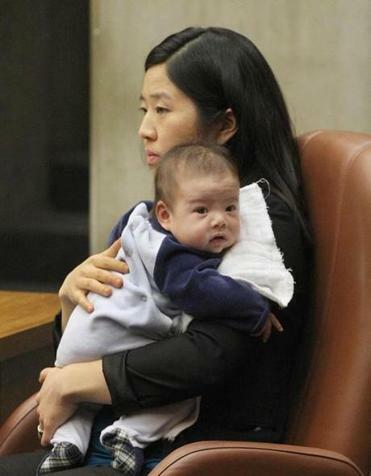 Boston City Councilor Michelle Wu held her 11-week-old son during a hearing on Boston’s Olympics bid on March 6. Paid Maternity leave remains an elusive benefit for many US workers, even as the rest of the developed world has figured out a way to make it a right. President Obama has spoken out on the importance of paid parental leave repeatedly, and recently introduced the benefit to federal workers. But paid maternity leave is far from becoming federal law. That’s why cities and states across the country have been leading the way. In a long-overdue move, Boston is set to become the next city to offer paid parental leave to some of its employees. Councilor at Large Michelle Wu and District 5 Councilor Tim McCarthy introduced the paid leave ordinance in the Boston City Council this week. The measure, also supported by Mayor Marty Walsh, merits prompt passage. It allows workers, both men and women, who have been employed by the city for at least a year, to take six weeks of paid leave in the event of childbirth (or stillbirth) or adoption. City workers will be paid their full salary the first two weeks, 75 percent of wages the following two weeks, and 50 percent for the last two weeks. Paid leave benefits employers as well: There are productivity gains, higher employee retention and female labor participation, and improved family incomes. Only California, New Jersey, and Rhode Island guarantee paid family leave, while cities like Austin, Chicago, and San Francisco offer the benefit to municipal employees. According to the Department of Labor, 13 percent of US workers had access to paid family leave at their jobs last year. For the public sector, the figure is 16 percent. The Globe’s Evan Horowitz estimates that only about 1,000 Boston city employees will be eligible for the benefit, since the proposal applies only to nonunion workers. Regardless, the move would provide real benefits to a subset of workers while sending a clear message to other businesses and institutions. It also comes as the satisfying result of electing diverse candidates to the council. “When you have structural barriers that make it hard for certain groups of people to participate in politics and policy making, you see that reflected on the laws themselves,” Wu said. Benefits that support families and return dividends to employers — in the form of higher productivity and lower turnover — make a compelling economic argument. The City of Boston is a $2.7 billion business that’s setting an example for others to follow.